Cisco-Eagle Catalog - CW-90X Over/Under Washdown Checkweigher - 12&quot; x 12&quot; x 4-1/4&quot; w/ 12&quot; Column, 25 lb. Cap. Scales > Checkweighers > CW-90X Over/Under Washdown Checkweigher - 12" x 12" x 4-1/4" w/ 12" Column, 25 lb. Cap. 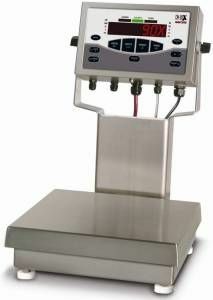 CW-90X Over/Under Washdown Checkweigher - 12" x 12" x 4-1/4" w/ 12" Column, 25 lb. Cap. The CW-90X checkweigher makes a great choice for heavy duty wash-down environments and HACCP requirements. With hermetically sealed load cells, a 304 stainless steel construction, an extra-strength piezo keypad, and an IP69K rating it is sure to survive daily sanitary wash-downs. The extremely tough piezo indicator is made to stand up against knife point contacts and is resistant to most contaminants and liquids. Platform: 12" x 12" x 4-1/4"
Display Resolution: 100,000 graduations max. The checkweigher load cell is stainless steel, increasing corrosion-resistance and life expectancy in washdown applications. The rugged piezo weight indicator display is designed to handle extreme abuse. Offering exceptional durability that can withstand sharp knife point contacts or other abrasive treatment. It also incorporates the unique Gore PreVent breather vent with Gore-TEX material. Which allows for air flow in and out of the indicator while simultaneously blocking water and dust. In areas of extreme temperature change, this breakthrough technology helps eliminate the possibility of damaging condensation. The keypad on the indicator features a touch-control front panel with keys for over, under, tare, zero, units, print, target, enter, menu, power, and ID. Also featured on the keypad is the ability for "Independent Key Disabling", giving you more control over which functions should be used. Outputs are communicated on a large, bold 0.8" Light Emitting Diode (LED) 14-segment, six digit rapid-response display and high intensity red LED markers with three color over/under bar graph. It is available in either 115 or 230 VAC. Please select which option meets your needs when ordering. Cisco-Eagle provides speedy service and expert assistance on all material handling products. If you need help of any kind, please contact us.